Oct. 6th still lingers as one of the hottest pours our members had ever experienced. Though the fall season was approaching, summer is the season that stayed for this pour. But that obviously didn’t stop the strong men and women that were dedicated to the mission of casting iron! 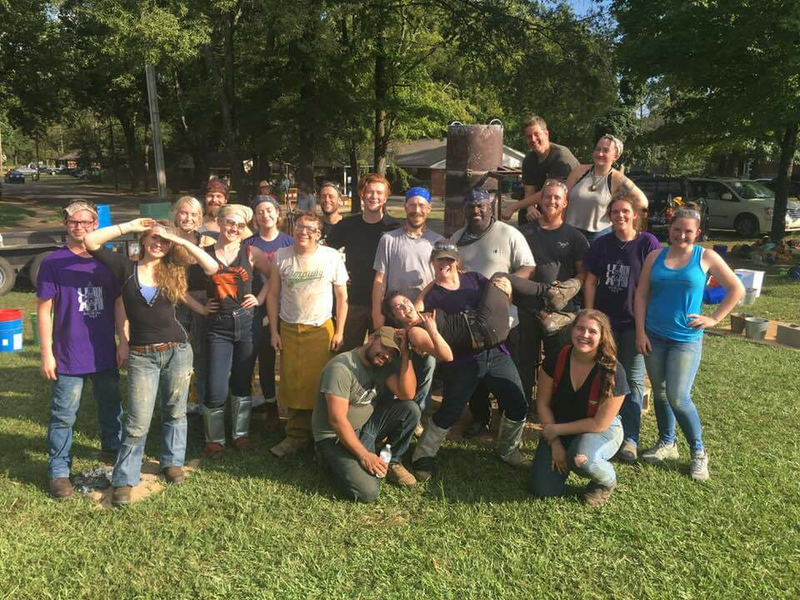 UCA Sculpture Club combined forces with the FEmale Foundry, UCA Alumni, University of Kentucky S.C.R.A.P. and student representatives from University of Wisconsin - Whitewater and University of Western Kentucky. There was scratch block making happening while these young artists ran the iron pour. A Scratch block is a cast iron relief sculpture that is made by mark making in a resin sand block. Both kids and adults were involved in this affair! Their creations ranged from writing their names, to Game of Thrones artworks! Once their scratching is done, UCA Students then poured their work right before their eyes! UCA and University of Kentucky Students created both sand and ceramic shell molds to be poured! These works ranged from bottle openers, tree nuts, and sculptures that will be finished up to be a true work of art. The furnace, Beaulah (named after Professor Bryan Massey’s grandmother) had an extended stack for this pour to allow more metal to be stacked inside. The FEmale Foundry donated the refractory material lined in her new stack. She tapped out about 800 lbs of metal. About 650 lbs of that metal actually went into molds. The Female Foundry will be taking a hiatus after this pour to ensure that the next one is bigger, better, and hopefully cooler than this one! Keep in touch with us and ask to be a part of our mailing list for future iron pours! If you want to read more about the pour, you can read all about it on the UCA Newspaper Website!